Tonight we come to the end of the "naughties" and usher in a brand new year with a full moon - something we are not likely to experience again until 2028. As we step across this invisible threshold, I am puzzled as to what this new decade will be referred to as: the "tens" perhaps, or maybe "teens"? More so, I ponder the current trajectory of the perfuming arts, and wonder where it will have taken us ten years from now. Much like orbiting celestial bodies, I expect we might come full-circle again, doubling-back on ourselves in a similar fashion as we have in decades gone by. The naughties saw us shift away from the androgynous, unembellished unisex styles of the 90's and return to excess and 'maximalism' in perfumery - a harkening back to the powerhouse styles of the 80's complete with overindulgent packaging and lavish bottle designs. Again, perfume followed trend as style-sultan Tom Ford and others reintroduced Hollywood glam and 80's immoderation to fashion. The naughties was a decade where we looked over our shoulders to reinterpret and reinvent the past. In addition, echoes of the roaring 20's and art deco themes resonated with the prolific reintroduction of chypre-style perfumes. In the last ten years, a marked return to traditional values and time-honoured muses prevailed. Perhaps the decade to come will see us oppose this inclination once again and veer off in favour of a more neutral, epicene approach to perfumery. It has become increasingly clear to me that innovation in this industry is a difficult thing to achieve. Few have managed to accomplish it and contribute something that severs the time-space 'loop' that sees us parrot ourselves every twenty or thirty years. Perhaps we are teetering on the edge of such a breakthrough. I guess only time will tell. Les Parfums d'Isabey was founded in Paris in 1924 by Maurice Loewe - backed by the Rothschild family - to produce high-quality perfumes in luxury packaging. It was named after Isabey, an early 19th century artist. It became best known perhaps for its scents Gardenia, (created in 1924 and revived again in 2002), and Bleu de Chine, created in 1925. Now, in 2009, Bleu de Chine has experienced a revival of its own, though now under the name Fleur Nocturne, as the original name has since been trademarked by another company. In 1925, the amethyst-coloured parfum flacon designed by Julien Viard and created by Ludwig Moser, was a much sought-after luxury item. The design was later re-realised in a cylindrical moulded glass eau de toilette presentation, reminiscent of a Chinese lantern with ornate embellishments in relief. This flacon is the basis for the modern 2009 interpretation which is rendered in smooth indigo blue glass. In 1941 the company was acquired by Marcel Guerlain (no relation to "that" Guerlain) and now Isabey is owned by Panouge Parfums, Paris. 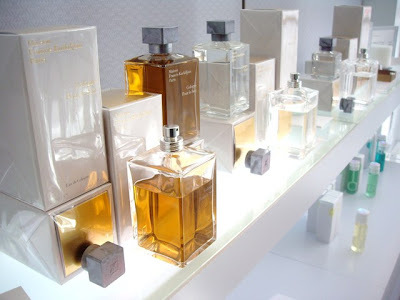 French perfumer Jean Jacques is the nose responsible for appending and reinterpreting the olfactory markers of the original release, and giving it a modern-day vernacular. Here, Jacques presents us with a dramatic floral arrangement with semi-sweet, nectar-like accords. Whilst the opening of Fleur Nocturne is delicately perfumed with soft white peaches and apricot blossoms, it is the heart of white flowers that forms the decadently sumptuous basis of this scent. Magnolias feature here in a similar fashion as they do in Acqua di Parma's Magnolia Nobile, however the heady perfume of jasmine swells in the air, just as their star-shaped blossoms do on the vine just before nightfall. A very spectacular gardenia note serves as the red thread that ties this fragrance to Isabey's Gardenia: a scent that is cherished for its lavish and masterful portrayal of this flower. A tender vein of vanilla meanders throughout the composition which not only acts as a fixative, but also as a supporting accord to the flourishing florals. The press notes accompanying the perfume suggest that patchouli also lends itself to the framework of this fragrance, but my nose simply doesn't smell it. There is no doubt in my mind that Fleur Nocturne is probably quite removed from the original Bleu de Chine. Whilst I feel it may flash a secretive wink at Isabey's esteemed best-selling perfume of the 1920's, I do feel it very much in the here and now. Still, one cannot fault the efforts of a perfume house that is willing to strike a balance between tradition and modern reinterpretation. Just as the beautiful flacon has evolved over the course of a century, I suspect so too has the perfume. Without the honour of sampling Bleu de Chine however, this is pure speculation. 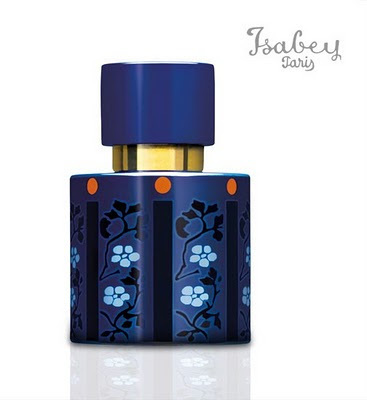 Isabey Fleur Nocturne will appeal to those who appreciate twenty-first century splendour with a pinch of sentimental whimsy. It is available in 50ml size for €129, from www.ausliebezumduft.de. Direct link here. As tends to be the case with many Comme des Garcons perfume collaborations, the partnership with British business, culture and design magazine Monacle has proven to be a triumph. 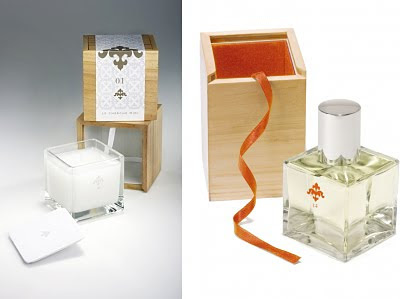 The limited edition 2008 fragrance release Hinoki put them on the map, and now in December 2009 the alliance introduces their second scent to date: Laurel. Perfumer Antoine Maisondieu (the nose behind Hinoki and fragrances from the Etat Libre d'Orange portfolio) was recruited a second time to give life to Laurel - a scent that is inspired by the fertile Bekaa Valley in Lebanon. Laurel opens with a blast of vivacious, aromatic green which is extremely sappy/resinous in nature. I liken the smell to the odour that is transferred to your fingertips when you crush the needle-like leaves of cypress pine in your hands. 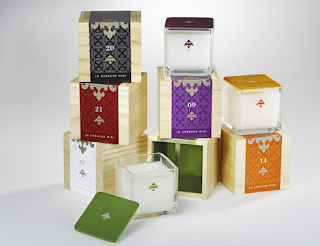 It is a sharp, sweet odour shared by many conifers, that also embodies the scent of the softwood at its heart. Earlier this year I blogged about Aleppo Oil sourced from Pinus halepensis - a pine species found across the Mediterranean, Asia Minor, Lybia and Syria, which has a very specific smell (one that is quite lemony in nature, and less "glacé" than many other resinous pines). To my nose, Laurel seems to embody this sensation of Aleppo, and those familiar with Aleppo soap products from Damascus will easily be cognizant of it here. It is also safe to say that laurel plays a starring role in this fragrance, and it does indeed - the distinct aroma of dried bay leaves is unmistakable here, and adds to the exotic eastern feel of the perfume. It has been cleverly married however, to other accords that pay hommage to this special part of the world. The Al Shouf Cedar Reserve covers about 5% of the overall area of Lebanon so it is only fitting that Laurel includes a cedar component. Fortunately though, it seems well removed from "stock standard" cedar that has pervaded perfume releases in the past few years. In contrast to this evergreen characteristic, and perhaps what I find most interesting about Laurel is how it prickles at the back of the nose with what I can only describe as a "white pepper" vibe which almost triggers a sneeze. I take delight in this physiological response, which I also experience when sniffing other scents like L'eau Bleue d'Issey and Eau de Sisley 3. This stimulating vein of pepper tingles over earthy patchouli, a wonderful resinous frankincense and warm amber accords to create a perfume that aligns my nose and draws my mind's eye once again to the colourful Near East. Laurel is a tenacious and spirited eau de toilette that has a rather linear composition (as one has come to expect from Comme des Garcons) and lasts well over nine hours on my skin. If the union between Comme des Garcons and Monacle continues to flourish, then I already anticipate a third release, every bit as spectacular as this one. Sorcery of Scent occasionally receives emails or comments asking me to make personal recommendations for reliable online fragrance e-tailers. 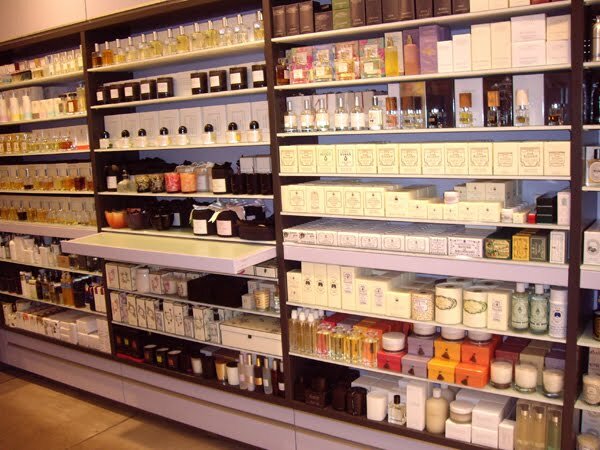 Whilst bricks-and-mortar stores can provide you with the opportunity to sample scents and enjoy the tactile aspect of holding the flacon and packaging in your hands, e-tailers offer accessibility to scents that might otherwise be impossible to source in your area. It is wise to embrace both online and offline methods to source your smellies and to ensure you're getting the best deal. 1. Online discounters provide a shopfront in which mainstream and (occasionally) niche perfumes can be purchased at a competitive price to the same products in bricks and mortar stores. There are often excellent deals to be had, but the only downside is that you never quite know how "fresh" their inventory is. A vast number of discounters offer testers, damaged stock and dead stock - perhaps items that have been difficult to shift in stores and have been stored for a number of years. Some of these online stores are hit and miss, so its important to find one that clearly disclose if they are selling testers, unboxed items and so on. www.strawberrynet.com is an online discounter that ships internationally that I can recommend. I have shopped with them for many years, and their generous loyalty program can offer you attractive bonuses. 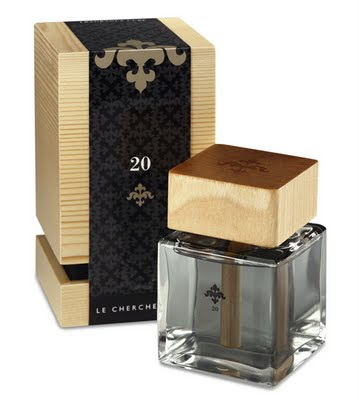 They are just beginning to add niche lines to their range such as Creed, Floris, Nasomatto, Serge Lutens and so on. 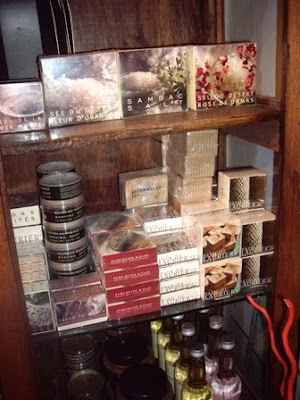 I have also had successful and reliable transactions with www.directcosmetics.com - a discounter operating out of the UK. 2. Online retailers include websites created specifically by individual perfume houses, and internet shopfronts that offer perfumes at "standard" retail (non discounted) prices. As a consumer, one might wonder why one would wish to shop at full retail price for goods that you might well find on a discounted website (and pay for postage to boot!)... well, the upside is that buying direct from manufacturer's websites can almost always guarantee the product is fresh and uncompromised, and you will more often than not have the opportunity to sample other scents from their line. 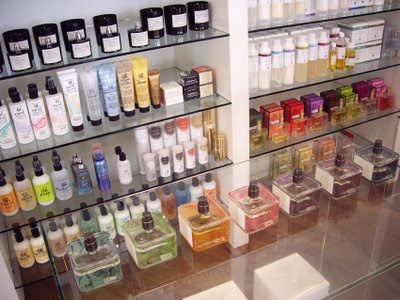 Perfume houses often reward customer loyalty for buying direct with catalogues and samples and small gifts. Joining the Thierry Mugler Circle, for example ( http://www.thierrymugler.com ), will mean you will be sent generous samples of new releases, digital media items such as perfume-related CD roms, and comprehensive literature. 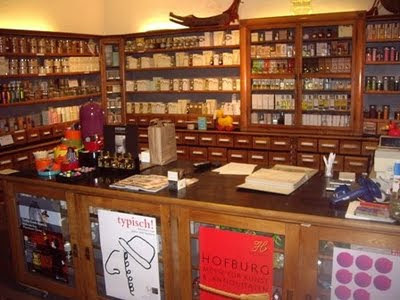 Other online shopfronts such as http://www.ausliebezumduft.de and http://www.essenza-nobile.de - both sites I strongly recommend for European perfumistas - cater to an international clientele, and build their business by offering a staggering range of niche and hard-to-find fragrances, and also offer generous free sampling programs. Some will also provide e-vouchers which will furnish the customer with 'cash' to put towards their purchases. 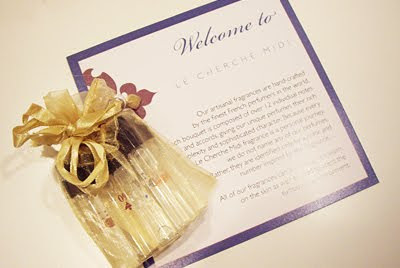 http://www.luckyscent.com is another reputable e-tailer that ships internationally, and is based in the USA. Whilst there are a vast number of e-tailers on the internet, it is always good practice to do your homework in order to determine whether a specific supplier is reliable and trustworthy. Customer feedback presented on "discounter" sites for example, is not always dependable as there is a slim chance it might well have been fabricated. A good resource available to cross check e-tailers and legitimate customer feedback can be found here. Basenotes is the leading internet perfume resource with over 35,000 members and 66,000 consumer reviews. Ultimately, a little leg-work, combined with some hours spent on the internet should provide you with a sound idea of what is available to you both locally and in cyber-space. Armed with this information, I wish you many enlightened perfume purchases. Footnote: At the time of publishing this blog, Sorcery of Scent has no affiliation with any of the e-tailers listed above. 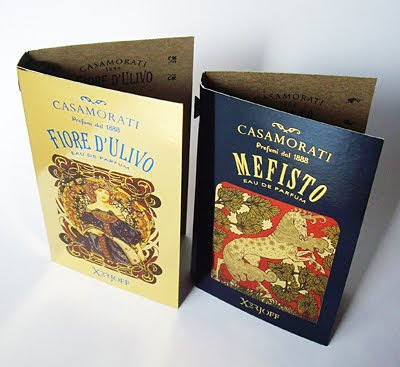 Calé is an Italian company with a fifty year history selecting and distributing niche perfume products, whom - through a dense network of personal relationships - have harnessed their increasingly intimate knowledge of the art of perfume composition and gone on to create something special. Calé Fragranze d'Autore (Calé Fragrances of the Author) is the brainchild of President Silvio Levi; a man whose passion and love for artistic perfumery has motivated him to create perfumes inspired by short excerpts from stories. His creations are "olfactory poetry", aimed at people who like to "listen" to perfumes and follow the narrative that unfolds from within. Italian nose Maurizio Cerizza is the perfumer chosen to interpret Levi's stories and transform them with mastery and elegance into stirring perfumed poems. 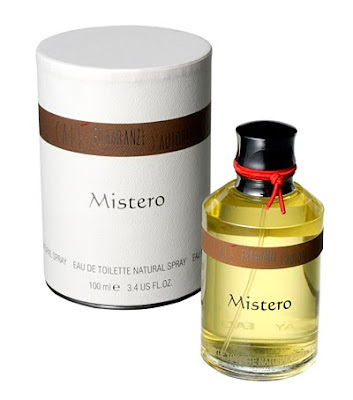 I have fallen for more than a few of the scents from this line - the first of which I'd like to highlight is Mistero. Classified as a Woody Aromatic men's scent, Mistero offers a warm complexity which transcends many offerings available in the current niche market. From the outset, the opening is fabulously peppered with the smokey, balsamic woodiness of agarwood which melds with a comforting semi-sweet distilled rum accord. I encounter a sense of familiarity here - not a likeness to another perfume, but rather an impression of having come inside from a campfire that has been dampened by rain, with the smell of smoke and rainwater soaking through my wool jumper. I also glean a sense of enjoying a nice boozy nightcap whilst sitting by a woodstove waiting for my clothes to dry. This underlying narrative is the olfactory tale that I begin to build upon as the author of my own olfactory experience. What I find interesting about Mistero, are the unique and unusual notes which, at a glance, might seem rather arbitrary. The bottom line is that, despite the somewhat unconventional inclusions of rhubarb, pimento and basmati rice, they all work profoundly well together. The rhubarb and mint accords in the top notes lend a well-rounded zippy crispness which all-too-often in perfumery, is usually attributed to essences from the citrus family. Here they furnish the opening spritz with a mouth-smacking tartness. The saffron is ever-present, but achieved with a very measured hand, and the basmati rice note is truly unique - it offers a starchy (almost lactic) accord which successfully rounds off some of the sharpness in the head notes. The pimento emits a certain ambient warmth, but the fundamental and (to my mind) most enjoyable aspect of this edt is the woody, musky base. The agarwood has a smokey, ever-so-slight medicinal quality which works well with the oakwood, resinous labdanum and a very visceral musk. Mistero prickles and glows like campfire embers, whilst at the same time, offers olfactory sustenance through the clever incorporation of familiar, almost edible accords. It is important to note however, that the final mix is far removed from those scents classified as gourmand. I find this marriage of components extraordinary. Silvio Levi and Maurizio Cerizza may be the very adept authors of this fragrance, but part of its appeal is the imagery it evokes in one's own mind's eye. It draws upon your inner reflections, memories, emotions, and associations. Mistero is stimulating and unexpected - much like the pages of a good book. Few scents I have anticipated more in 2009 than the recent offering from Italian apostles of au courant, Costume National. Costume National Homme marks a departure from the house's unisex/androgynous fragrance portfolio by offering for the first time in their 21 year history, a scent aimed directly at the male market - and I, for one, am excited. So few men's scents these days are created in an eau de parfum concentration, but here Ennio Capasa and team have responded to the pooled male petition for scents that are far from fleeting. What I notice first about the bottle and packaging is that all the signature CN aesthetic sensibilities are present and accounted for; a restrained neutral colour palette, architectural lines, and new innovation - all utilised with understated intent. Innovation comes in the form of an invisible tube to draw up the juice: something never seen before. When applied, Costume National Homme surprises with a mouth-watering opening of citrus, patchouli and cinnamon/nutmeg, which is very addictive in nature. As the alcohol evaporates, I get a lovely warm "peach cobbler" vibe and enjoy for a time, the lip-smacking aroma of oven-baked comfort foods. Ten minutes in, and the saccharine edge tapers away to reveal the lovely bittersweet prickle of clove and husky woods. Here is where this scent hits its stride, evolving from something with rich gourmand nuances to a fragrance with a sophisticated spicy heart. Wisps of sweet-scented sandalwood materialise slowly from a resinous/ambery labdanum base (in fact, one that is not too far removed from Zara's Ambar). Over the course of the drydown I also observe curious tendrils of what I can only describe as 'geraniumint' reaching forward and then receding; fleeting moments akin to Frederic Malle's Geranium Pour Monsieur, perhaps. It may be no coincidence that Dominique Ropion is the author behind both perfumes. 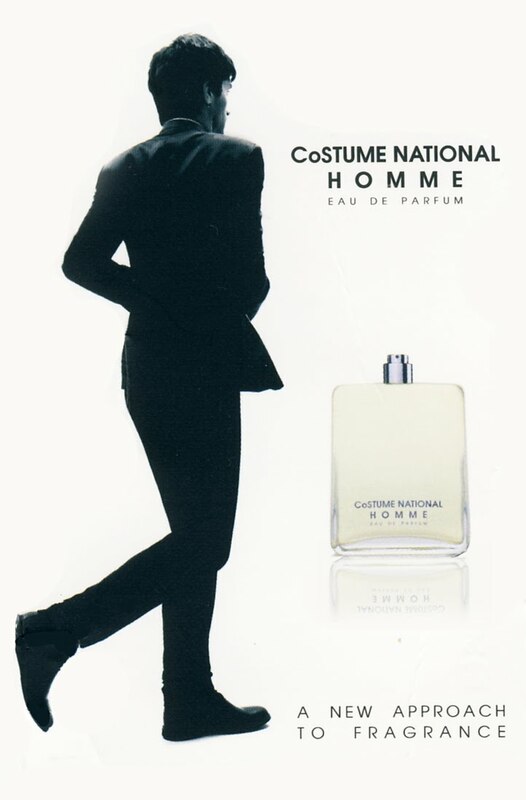 Hours later and CN Homme is still going strong... Im pleased to say the promise of increased longevity that this eau de parfum can offer does not disappoint. My skin remains perfumed with earthy patchouli and a scattering of fragrant wood shavings: perhaps shavings struck from a knotty clump of overgrown herbs that have long since gone to seed. I will be the first to admit that, on the whole, I enjoy much of what Costume National as a fashion, design and perfume house has to offer. 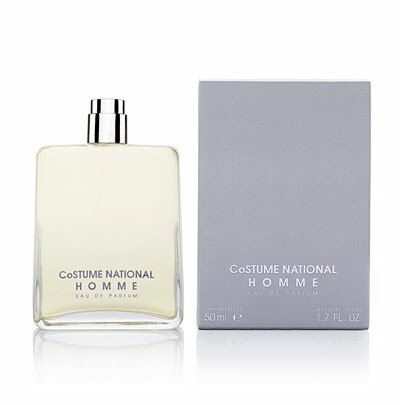 Costume National Homme is not at all out of place in their current perfume portfolio, and might well attract a new unisex fanbase. For now however, I cant think of a better scent to wear over the Holidays. By far the most enjoyable destination for fragrance lovers in Vienna is to be found at Tuchlauben 17 just a stone's throw from Stephansplatz in the city center. 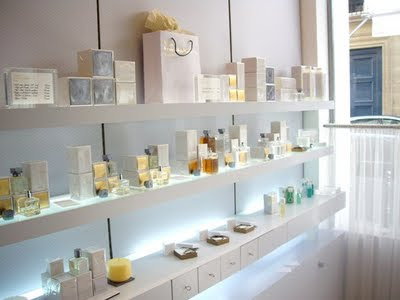 Much more than a perfume store, Duft und Kultur is a welcome retreat and conceptual shopping experience. From the street front, the store's facade is sleek and understated, but when you step inside it feels as though you have walked into an exotic bazaar of smells, colours and textures. Old empire apothecary cabinets brim with scented candles, bundles of incense and pretty bottles of niche and hard-to-find perfumes from international perfume houses. Duft Und Kultur embraces all things fragrant, and celebrates their far-flung source - the sprawling boutique itself like a tattered passport stamped with destinations both exotic and enticing. 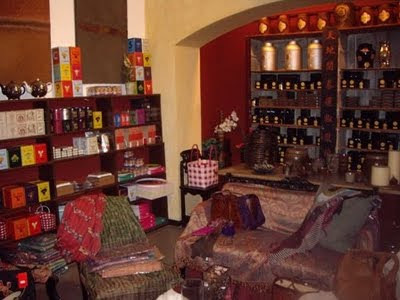 Small alcoves and shuttered vitrines house fragrant teas , rich textiles, hand-made pottery, oils, lotions, resins, salves and colognes, and one cant help feel captivated by the scope and bounty of the goods on offer. 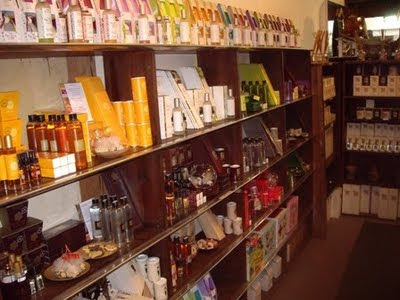 On this particular visit, Antonio and Lisa - the very accommodating staff - allowed us the time and space we required to meander through the shop and turn things over in our hands; sniff, shake, spritz, scatter, clatter, unfurl, uncurl and completely exhaust our senses. I scooped up several boxes of oliban from Yemen to burn over coal discs, whilst my wife inhaled the luxurious nap of deep suede handbags (of which she later bought three!). A known stockist of one of my favourite "go to" scents, Molinard Pour Homme II, Lisa and Antonio offered me generous samples as consolation when I was told my scent was out of stock, and each took the time to show me something new and different that perhaps I might not have considered otherwise. 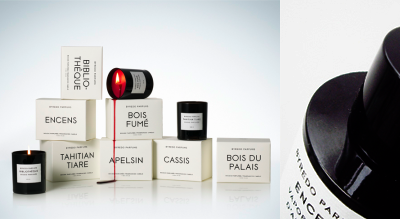 Duft und Kultur carry a bountiful selection of scents and scented products from Comptoir Sud Pacifique, Lubin, L'Artisan Perfumeur, Esteban, Diptyque, Molinard, Fragonard, and many, many more. The real treasures are to be found however, by exploring every nook and cranny where interesting artefacts reside (jasmine or damas rose-infused sea salt, for example). Duft und Kultur cater to a clientele who have a distinct appreciation of perfumed products and their origin, and offer five-star service. Absolutely not to be missed when visiting Vienna. Mon-Fri. 10am - 6.30pm, Sat. 10am to 5pm. 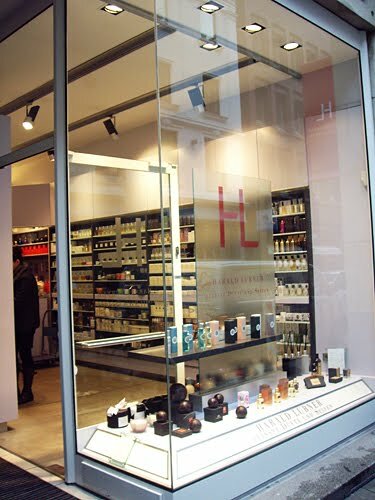 A few years ago I wrote a glowing review about Le Parfum - a Viennese niche perfume retailer in the heart of the Austrian capital which I felt at the time had ticked all the right boxes. On my first visit since, I sadly learned that things at Le Parfum were no longer quite up to par. The blonde saleswoman behind the cashdesk bewildered me somewhat, enough so to make me seriously wonder if she was on meds. Any conversation I attempted to strike up about their perfume selection shifted swiftly into a discourse about how the store owner was currently holidaying in Crete, and having a wonderful time. I wondered if the €10 hike on most prices in the store was helping pay for this exotic Grecian excursion. Instead of buying the Nasomatto Black Afgano that I had intended; I scampered. I returned a week later figuring I'd give them the benefit of the doubt. When I entered the store this time, I was delighted to see the original sales assistant whom had helped me on my first exceptional visit a few years ago. I smiled broadly but was met with a lukewarm gaze. When asking a few questions that I had saved since my previous (doomed) visit, I received responses that were every bit as tepid as her stare. I couldn't help but feel I was intruding when a young man who was clearly waiting for her shift to end or to meet with her stared at his watch and shifted in his seat impatiently. Instead of indulging my senses, I plucked the Nasomatto from the shelf and made for the cash register. Where samples were once generously offered in the past, this time one was dropped into my bag upon my request. It could be that I walked in on two occasions when the sales assistants were having a bad day, but the odds of my visiting again have now diminished. Le Parfum is still a good little outlet for niche scents in Vienna, but recommended only if you cant find what you are looking for elsewhere. City Shopping Feature: Marchée aux Puces de Saint Ouen - Paris. 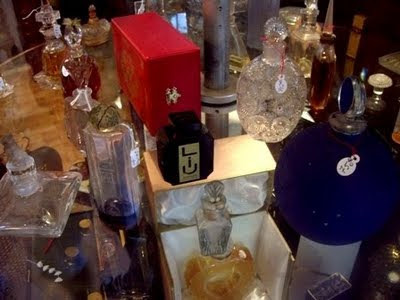 Perfume shoppers descending on Paris may be under the misconception that they are likely to unearth some rare treasure at one of the many flea markets around the city. It is true that the very keen-eyed collector who is prepared to drag themselves out of a warm hotel bed at 5.30am on the first market day of the week MIGHT just stumble upon something special... if they know what they're looking for of course! Sadly, bargains are few and far between, despite the many markets dotted in and around the capital. It would seem the Parisians know only too well the value of their wares, which makes treasure-hunting an expensive affair. The wildly popular Marchée aux Puces de St Ouen is no different. Situated north of the city center, the marketplace comprises 13 individual smaller markets and covers over 7 hectares of land! For those wishing to fossick through old books, retro light fittings, frames and mirrors and an enormous variety of bric-a-brac, the pickings are excellent. 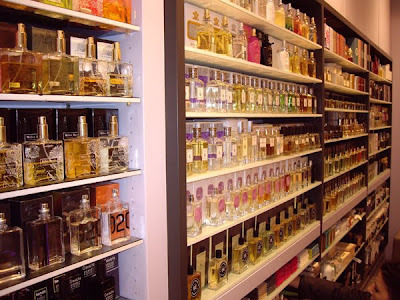 For the perfume aficionado however, there is a scant selection to be found. Small stalls particularly in the Vernaison quarter offer the occasional vintage or mainstream figural bottle here and there, or perhaps a long-discontinued miniature at a reasonable price (I bought a 7ml bottle of Guerlain Derby for just a couple of euros). When you do stumble upon what looks to be a forgotten Lalique flacon that appears to have been thrust to the back of a dusty shelf at the rear of a dodgy store (with your heart hammering in your chest), you will almost always find an accompanying sticker on its base that reads €800, or similar. 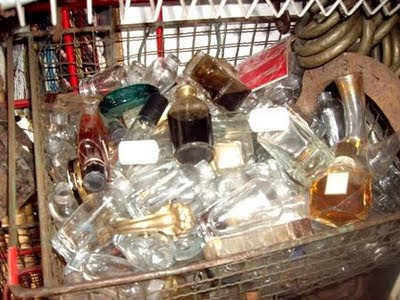 Unfortunately, much of the perfume clutter is just that: clutter. Perhaps more of a showcase than a retail outlet, I'd recommend visitors to the St Ouen market drop by Eliane-Parfume - a small stall in Le Marché Vernaison. 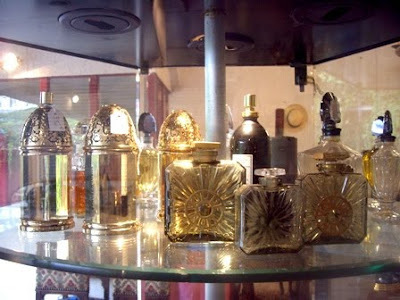 Here, one of the most delightful collections of perfumes modern, vintage and rare are on display behind tall glass vitrines. Many are for sale, and some are not, but all are lovingly presided over by Mme Eliane who has collected each miniature, factice and flacon one by one. Guerlain enthusiasts will see a gorgeous display of rare and unique bottles, and Mme Eliane houses some truly stunning Lalique bottles from the turn of the century. 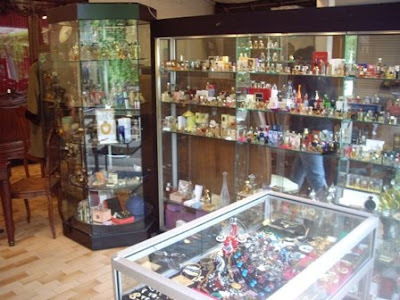 A large display case also holds rare and enchanting perfume jewellery and promotional items - pins, bracelets, scarves - many given as gifts with purchase, or to sales reps to be worn as a part of their standard uniform. Mme Eliane is happy for you to browse and take pictures, but the promotional items are not to be photographed; "its complicated" she insists, whilst shooing you away with both hands. As beautiful as they may seem, the rarities don't come cheap, but some very reasonable purchases can be made on modern bottles and factices. As for me, I bought nothing on this particular visit... instead I ooh'ed and aah'ed through the vitrines, pleased that after a long day of rummaging through boxes and baskets, I had been rewarded with this visual feast. Le Marché aux Puces de Saint Ouen is open Sat-Mon. from approximately 10am to 5pm. When visiting France, a stroll through the Jardins des Tuileries in Paris is highly recommended. If not for the lovely gardens, then perhaps for one of the prettiest vistas in the capital. Les Jardins lie on the doorstep of the Musée de Louvre, and run parallel to the picturesque Seine – they offer a 360 degree view of stunning Parisian architecture, le Arc de Triomphe and achres of enchanting manicured lawns. Just a few yards from this sprawling oasis, is Rue d’Alger – a tiny side street that boasts a brand new attraction – that is, the delightful Maison Francis Kurkdjian; a tiny boutique housing the latest perfume narratives of the award winning Parisian nose. At a glance, the entrance to the store looks like it has been over-fortified with architectural beams of iron and panes of glass... the imposing door towers over us as we push past it and step into the foyer of the boutique from the quiet street. 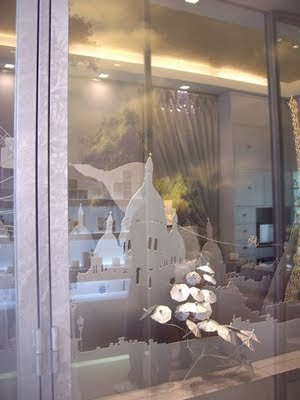 The atmosphere feels instantly perfumed with invisible candles, and we stop for a moment to marvel at a charming cityscape of Paris that is behind glass and has been created from tin and gold coloured metal, that runs the length of one wall. I immediately think of whimsical and elaborate Danish paper cut outs. Beyond, we enter a room whose interior is tastefully decorated in harmonious white, grey and gold hues and a friendly young Parisian woman bids us “bonjour” and flashes us a winning smile. 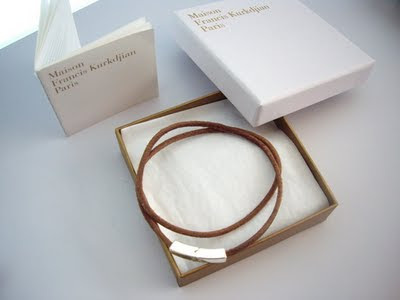 I explain that my companions and I have waited a long while to visit the boutique, and ask to be introduced to M. Kurkdjian’s latest creations. The young woman, Donatienne, is only too obliging, and begins by explaining that the miniature skyline of Paris in the vitrine behind us, is the world as seen through the eyes of the Perfumer... we turn on our heels and look back upon the display and each sigh accordingly. I note that the materials used to create it seem muted and hushed, and am awash with a sense of calm. We turn back to the products assembled in front of us, and Donatienne points out that the perfume packaging echoes the aesthetic of the store, and of Paris in general... the raw tin caps afixed to the heavy glass flacons represent the materials used in architecture, and the flashes of gold incorporated into the line of packaging, mimic the gold used across the city on the ornamental Parisian monuments. We are impressed at the overall aesthetic and cohesiveness. But we are eager to sample the line. 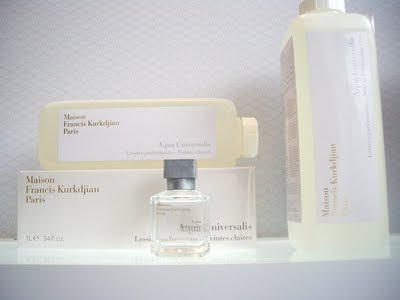 We begin with Aqua Universalis – Kurkdjian’s take on a “clean” fragrance, which immediately conveys a vivifying sense of freshness: an eau de toilette that is as simple, as universal and as timeless as a crisp white shirt. Donatienne explains that this scent was created not only to wear, but also to perfume linens and fabrics. I could easily imagine how luxurious it would be to wake up on 1000 thread-count sheets that have been imbued with this perfume. We are then introduced to Cologne Pour le Matin - a generous 200ml bottle of scented water which Kurkdjian proposes is to be worn after slumbering, and its counterpart, Cologne Pour le Soir; a scent created to evoke warm feelings of comfort and love, and of being wrapped in cashmere. It is dark and ambery and I smell husky curls of incense permeate from within. We sample more. Lumière Noire pour Femme and Lumière Noire pour Homme. My eyes widen as the latter is lifted to my nose... its lingering sillage is similar to that found in Kurkdjian's other perfume triumph, Narciso Rodriguez For Her (the edt version). I find it interesting this accord is now used as the base in this new men's creation. The female version features patchouli and rose, and evokes an unusual sense of chaiaroscuro – sometimes light and playful, and other times dark and dramatic. By now, I find myself holding a number of cards in the “must keep” hand, and my arms are both heavily perfumed to the elbows. My friends and I offer our wrists to one another and fan cards under each other’s noses as our patient host looks on with a smile... it seems she understands how captivating these scents are. APOM (A Piece of Me) pour Femme follows next, and I find my wife in raptures marveling at this glorious scent which is heavy with ylang ylang and causes her to inhale her wrists repeatedly. 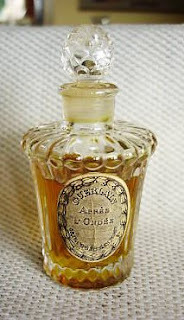 APOM Pour Homme is a masterful balance of neroli, cedar and warm amber. My friends and I peruse the shelves and notice the diversity of goods on offer - aromatic paper strips that are designed to be burned, scented bubble-blowing solution, fragrant laundry detergent, scented candles, leather bracelets imbued with perfume, and of course the line of eau de colognes, toilettes and parfums. 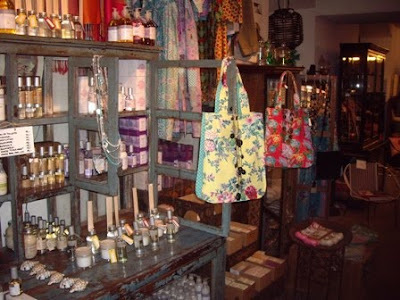 It seems to me that anyone visiting the boutique would find something appealing to take home with them. For me, it was the 200ml bottle of Cologne Pour le Soir at €140. Donatienne cheerfully processed the sale and buried a generous number of samples in the monogrammed tissue paper that surrounded my purchase. We left the store feeling as though we had spent 30 minutes or so in Donatienne's very capable hands, and with a wish to return at our soonest convenience. 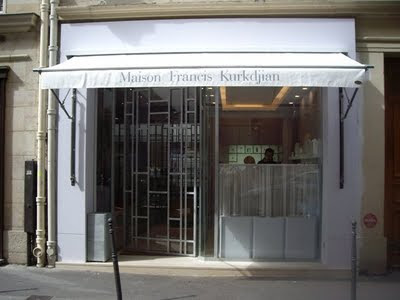 Maison Francis Kurkdjian represents for me, a vivid perfume narrative of the city I was visiting. Whilst these scents might be considered 'niche' in terms of their accessibility, they truly seem more "honest", and without a trace of pretentiousness. I am confident we will return every time we visit the capital. I've always appreciated Issey Miyake's perfumes and unfussy advertising. 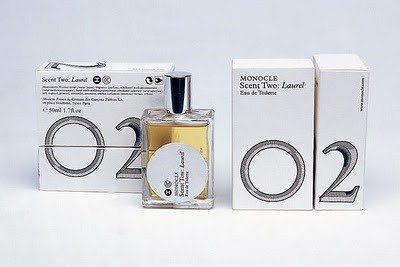 Sometimes however, I get the impression that his "minimalist" aesthetic is just a ruse... after all, I find the perfumed releases from his line really rather complex, despite their purported 'minimalist' approach. Take the groundbreaking Le Feu d'Issey for example - a perfume that lived a very short life for being way too avante garde... its vast array of notes and accords ran the gamut from sichuan peppers to Japanese lilies, to milk; the end result representing his take on the elemental force of fire. It was an extraordinary synthesis of accords that, when it appeared on department store shelves, was bottled and packaged in clean, simple, Miyake-esque geometric shapes... a sphere inside a cube. What else? Even the starring pair in his perfume portfolio L'eau d'Issey and L'eau d'Issey Pour Homme - which portray the purest and most basic of the elements: water - have compositions which are really very intricate. 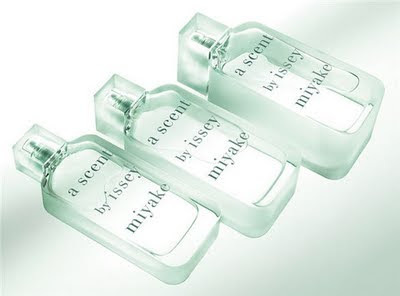 Miyake's 2009 women's release: a scent, is no different. At a glance, the transparent heavy glass flacon and the colourless liquid it holds both seem to epitomise the Miyake approach of understated, unembellished functionality. 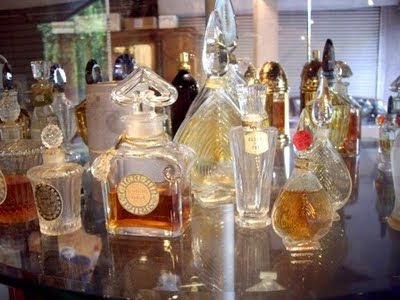 Even the name a scent is as uncomplicated a name as one can possibly assign to a perfume. This being said, it is when you actually come to experience the perfume itself, you learn that once again, the bottle's contents belie this perception. The introductory spritz furnishes the wearer with an extraordinary feeling of green... sharp, crisp, rich emerald hues, which are not at all unlike the herbaceous, sophisticated opening puff of Sisley's Eau de Campagne. It prickles with ripe citruses before meandering towards a wonderfully rich floral heart. Intoxicating jasmine and hyacinth smoulder and there are fleeting moments of the heady floral rubberiness one can experience whilst wearing Fredric Malle's En Passant. The overall impression is as if walking through a beautiful garden at the height of summer with the verbena and hyacinths in bloom - totally enchanting and also a little overwhelming. Fortunately, the crisp green and shimmering citruses manage to reign in the opulent florals. The tail end of this fragrance shifts towards a "freshly-washed" soapiness - something that renders a scent the perfect vivifying fragrance to be worn in (but not limited to) hot weather, or during long-haul travel. This eau de toilette lasts a satisfying 7 hours on my skin. The very fact that Issey Miyake can cram an entire European summer garden into a modest glass bottle and market it in an unostentatious manner, really speaks to me of his extraordinary vision. Whilst many others would resort to smoke and mirrors, Miyake strips them back - so sure he is that a scent will be well received. His aesthetic may be minimal, but his perfumes are sincerely profound. To my mind, anything that bares the signature of French fashion/fragrance house Comme des Garcons is something to be explored. For the past forty years CdG's owner Rei Kawakubo has continually shocked and amazed with cutting-edge fashion, boutique installations and advertising that are all extremely avant garde in nature. 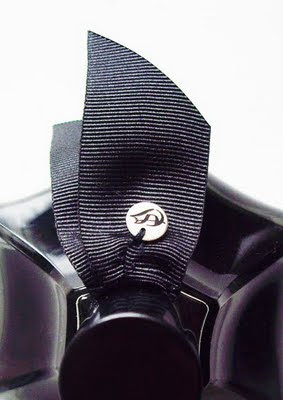 Their approach to perfume has also always been unconventional and innovatory - from their world's first "anti-perfume" release in 1998 titled Odeur 53, to their more recent Synthetic series. It hence comes as no surprise to me that Comme des Garcons teamed up with British milliner extraordinaire Stephen Jones, winner of an Outstanding Achievement Award in Fashion for his flamboyant and progressive headwear; to create the perfume Stephen Jones Millinery. As one might expect from such an alliance of pioneering minds, Stephen Jones Millinery is both remarkable and unique... it bears the nonconformist olfactory fingerprint of CdG, and the outlandish aesthetic of Stephen Jones. Beautifully packaged in a jet-black miniature hat box and wrapped in a milliner's veil, the obsidian-coloured flacon is semi-organic in appearance - reminding me perhaps of a galactic seed-pod waiting to eject perfumed spores into the air. As I turn it in my hands, deep inside the bottle one can see flashes of violet as the light picks out its facets. There is something cold, alien, or otherworldly about it. The juice itself sparkles with aldehydes as it is first applied, like some shiny, twinkling nebula. It is a bracing introduction to a perfume which is very Comme des Garcons: unruly, bold and commanding. Violets feature heavily in the opening of this scent, but it is not a mainstream interpretation of violets: they are cold and metallic, as if plucked from the gardens of a dark moon found in some distant starscape. CdG list meteorite and magma as starring accords, and one would agree that they have succeeded in introducing a cold mineralic quality to the composition. The scent does however, retain some earthbound accords as well - a dewy rose, peppery carnation and slightly muddy vetiver feature, though, I get the impression that they too may have been cryogenically frozen and then defrosted again in some intergalactic ark. There is a distinct sensation of breathing refrigerated air here which is not at all unpleasant... just interesting. If Stephen Jones and Comme des Garcons set out to compel and inspire, then they have succeeded. Few scents these days make me literally step back and say "Wow!" because sometimes I just feel as if I've "seen it all". Fortunately, Millinery exceeded my expectations and has given me much to ponder. As my wife and I share our 50ml bottle, (and in doing so garner peculiar stares at the sushi bar or ATM); I reflect upon the future of perfumery and what could be regarded as the final frontier. Stephen Jones Millinery is exclusively available in 50ml bottles, and lasts up to 7 hours on my skin and 9 hours on hers. Its sillage is above average. One definitely worth experiencing. In April of this year I blogged about a niche Italian fragrance house whose star is on the rise: XerJoff - a brand that embraces the idea of opulence and excess, and whose perfumes are nothing short of stupendous. 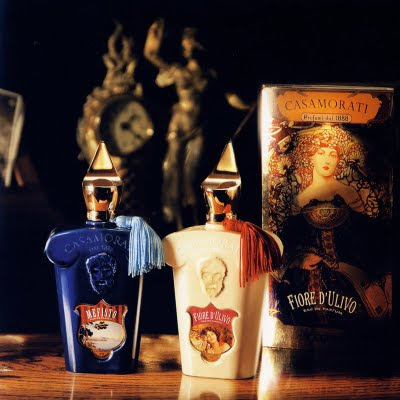 The most recent series in the XerJoff line is the delightful Casamorati range - a collection that preserves the distinguished history of a glorious fragrance house that was founded in Italy between the 18th and 19th centuries. The House of Casamorati was traditionally revered for its perfumed bathing soaps, and the vintage aromas once used to scent their creations have now been reincarnated in the form of this stunning Xerjoff perfume duo. 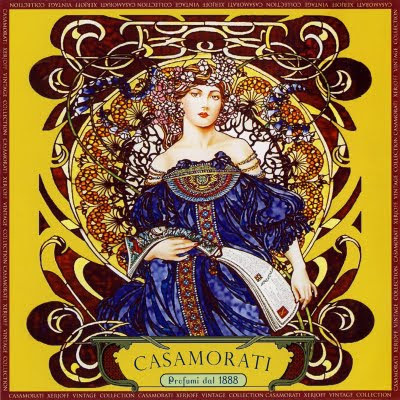 XJ Casamorati 1888 comprises two eau de parfums - the first Mefisto; an uplifting Italian oriental scent for men, and the second, Fiore d'Ulivo, a fresh floral for women. To my nose however, each of these scents can easily be worn and enjoyed by both genders. Mefisto is a tribute to classic Italian colognes, with a crisp citrus opening leading to a more floral heart of lavender, rose and Florentine iris. These accords shimmer over a rich base of sandalwood, cedar, vanilla and musk... the overall impression reminds me a little of Creed's Silver Mountain Water; however Mefisto offers something more of a classic Mediterranean character with rich undertones that lends it a soft and luscious oriental finish. In terms of refinement and finish, the Creed simply does come close. But for my money, I am very taken with Fiore d'Ulivo... a parfum which embodies spring time in the Mediterranean, where the olive trees bloom for just a few days each year. This perfume is a simple composition, using just a handful of ingredients, but one with a very profound outcome. Fresh citrus and lotus flower rest at the top of this scent, where the gentle olive blooms take a starring role. For anyone who has smelled olive blossoms straight from the tree, Fiore d'Ulivo is a very accomplished rendering of that lovely perfume. Tender jasmine and magnolia emphasise the floral facet, and there is a lush soapiness present which conjures a sense of vivifying purity; as if having just washed ones hair in natural rainwater that has been perfumed with tiny flowers. Clean amber and musk lie beneath which add depth and a feeling of richness to the mix. XerJoff are not mincing words when they refer to Fiore d'Ulivo as a "magical springtime potion". Gratifyingly, both Mefisto and Fiore d'Ulivo are offered in generous eau de parfum concentrations that render them detectable on the skin some 8 hours later. The Casamorati collection are available through very select retail outlets in the UK, France, Italy and Russia, and retail for €165 each. The perfumes pictured above show this range presented in exquisite hand-made Chinese porcelain flacons, however due to the unexpected porousness of the bottles, they will soon be shipping in beautiful glass flacons instead. Should you ever come across a porcelain presentation, it will surely serve as a very rare and precious keepsake. Ever since my love affair with Colonia Intensa germinated in the autumn of 2007, I find myself drawn to all that Acqua di Parma does. If I had a silly amount of money to spend on lavish leather goods and plush towelling robes, I would find myself jetting off to Milan's Acqua di Palma Via del Gesu' boutique to stock up on trinkets. As far as fragrance is concerned, whilst the original men's Colonia does not appeal to me much, I have a strong appreciation for the Colonia flankers and the women's bewitching creation Iris Nobile. Today, much to my delight, I had the opportunity to experience the latest in the women's "Nobile" series: Magnolia Nobile. Magnolia is the protagonist appearing in the lush villa gardens sprawling around the enchanting Lake Como. Blushing blossoms reach skyward amongst a mosaic of roof gardens and terraces, whilst releasing their rousing perfume on the air... it is a flower that exudes a timeless sense of elegant femininity. 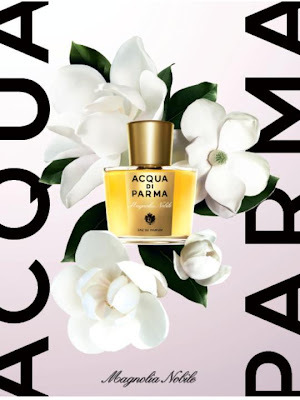 It is no wonder that Acqua di Parma awarded her a starring role in this new eau de parfum. Magnolia Nobile is an abstract of true magnolias - a foray into enchanting florals, much in the same way Iris Nobile demanded your nose attempt to conjure an image of purple irises. Magnolia opens with what I would call the "signature" Acqua di Parma topnote of bergamot and lemon which are distinctly Mediterranean in style. 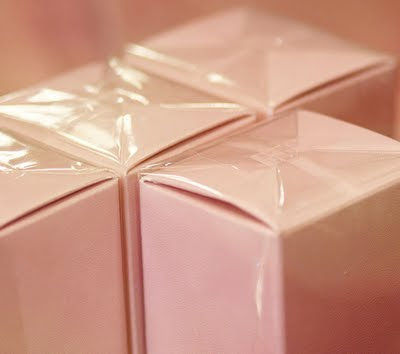 A puff of cedar beckons the nose into a rich floral heart of magnolia, rose, tuberose and jasmine... but there is also a crystalline sharpness which is akin to the Egyptian white musk abundant in Narciso Rodriguez for Her. An adept marriage of floral accords and earthy patchouli and sandalwood makes Magnolia Nobile both modern and whimsical. It is a scent of contrasts in which radiance meets velvety softness. Whilst I wouldn't call it particularly ground-breaking, I would call it a very sophisticated scent of noble intention. Magnolia Nobile sits close to the skin, and lasts approximately 6-7 hours. I think it a very fitting scent to demonstrate the evolution of the "Nobile" series, and an ideal perfume to celebrate these final days of summer as the days draw in. Celebrations in the Orthodox calendar are numerous. Whilst I grew up far from my Greek heritage and motherland, as an adult married to a Serbian woman, I find myself more and more immersed in the rich tradition that Orthodoxy embraces. Today, on August the 2nd, my wife and family celebrate the Serbian Orthodox feast of Prophet Ilias... an annual observance of the family's patron saint. The day often begins with a ritual visit to the Orthodox church where slavski kolac - a traditional bread is blessed, and then taken home to be eaten with lunch. Whilst I'm not particularly devout, I do enjoy the opportunity to visit the church with its highly decorative wall paintings and cavernous ceilings. The interior is usually dimly lit with flickering candles which illuminate the centuries-old icons around the room. The air is thick with the smell of beeswax candles and billowing incense, which spills from golden swinging censers. Our occasional visits to these closed spaces result in a sensory blitz of enormous proportions, but when we arrive home again, we find our clothes have been imbued with exotic resinous perfume. For some time now, we have wished for the perfect incense with which to scent our home in the very same fashion. at its heart - something akin to rose - but this only lends a tender dewyness to the mix. I sense the green tang of bay leaves at its core too... the sum of these ingredients make for a comforting, warm, mouth-watering spray that perfume the home magnificently. It may be a far cry from the censers of the Greek or Serbian church, but Encens is what we want our home to smell of... husky incense; perhaps coupled with the persistent aroma of gingerbread baking in the other room. A few spritzes on the sheer curtains pulled across an open window will scent our house for hours. 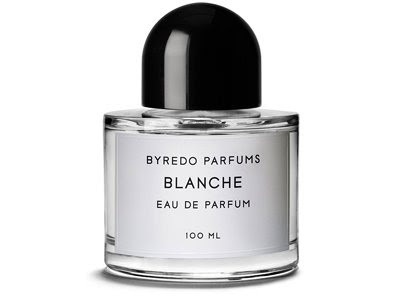 It is unfortunate that Byredo have decided to cease production of this product. It could quite possibly have been one of those 'best-kept secrets' that people pass on to one another by word of mouth. I am shouting it from the rooftops in the hope that you, cherished reader, still have the time and motivation to get out and source some. While you're at it, have a sniff of Byredo's Bibliotheque room spray for a ground-breaking olfactory experience. It must be hard being Tom Ford. Despite the obvious glamour and celebrity associated with being one of the world's largest contemporary style icons, I can not begin to imagine how much pressure comes with that role. I have trawled the internet looking at photos of Ford, and in every one of them he looks immaculate. Can Ford have a bad hair day? Unlikely, I'd say. So, how difficult would it be to maintain that face both publicly and privately, 24/7? In business, everything the man touches turns to gold and he is often revered as the yardstick against which other designers are measured. His refined, chic, editing eye and fastidious work ethic has seen him reach dizzying heights. People aspire to be like him, taste his fame, and dream to achieve just a fraction of the success he has enjoyed. Ford must be under enormous scrutiny, whilst competitors and adversaries wait for him to stumble. Expectations are stratospheric every time this man opens a boutique, launches a line, or bestows the world with a new perfume creation. I do not envy this man. Perhaps I too, have unrealistic expectations of Tom Ford - after all, in my opinion, the man has never failed to amaze and inspire me - his superb tailoring, à la mode accessories and stunning private blend perfumes have me pressing my nose at boutique glass windows the world over. Therefore, when I hear of an impending Ford fragrance release, I anticipate perfection and nothing less! Am I being unrealistic in doing so? Hell no... the man has a crack-team of professionals working around the clock under the Tom Ford Beauty umbrella, and cash and resources coming out the wazoo! Imagine my crushing disappointment then, dear reader, when I sampled the upcoming Tom Ford men's release Grey Vetiver, set to hit shelves this September. Whilst I appreciate the continuity and cohesiveness of the colour-coded Tom Ford fragrance names (Black Orchid, White Patchouli, and now Grey Vetiver), what I find I don't love is the actual scent itself. The name Tom Ford is a brand synonymous with innovation, but here all I see is simulation... reproduction, replication, emulation. As much as it hurts me to say so, I can already identify a handful of scents that Grey Vetiver is a perfumed parody of. The opening starts out with some promise... a rush of citrus (maybe bergamot and mandarin?) and winter green, veiled by a palpable smokiness; Bvlgari Pour Homme Extrême immediately springs to mind. I think of someone throwing wet leaves onto a fire in the corner of their garden under a solemn grey sky. (Not wishing to overly romanticise the idea, I'll leave the metaphors at that... think: grubby old gardener in overalls, as opposed to a muscle-flexing pool boy). Without any perfume pyramid available for this release, there is an earthiness present that one normally associates with vetiver scents, and I am picking up what I believe may be traces of black pepper and guaiacwood at its heart. For those familiar with Andy Tauer's Vetiver Dance, there are parallels one can draw between the two, though the Ford release is less rambunctious than Tauer's. I also recognise hues of Narciso Rodriguez for Him... the thick, damp fougere vibe is common to them both, as is a sense of austerity and coldness. Grey Vetiver I feel will appeal to a more mature set - I can't imagine many twenty-year olds reaching for this before heading out for a night on the town... it is a little more corporate in style; more reserved and unapproachable. Several hours later, and I am left with Versace Jeans Couture Man on my skin... quite possibly one of my least favourite scents - an odour I've always associated with washing dirty cat bowls under hot running water; with something fatty and jellied at its heart. Thankfully (for those who will like this), the scent's persistence is well above average. Not so great if you feel you smell like cat's breath. After this experience, I have come to understand that, (at least in my eyes), Ford is fallible. Grey Vetiver is the first of his scents that I cannot and will not wear. Perhaps not the outcome I might have liked, but there are always his four new White Musk Private Blends to look forward to. The Sorcery of Scent will be reviewing White Suede in the week to come.